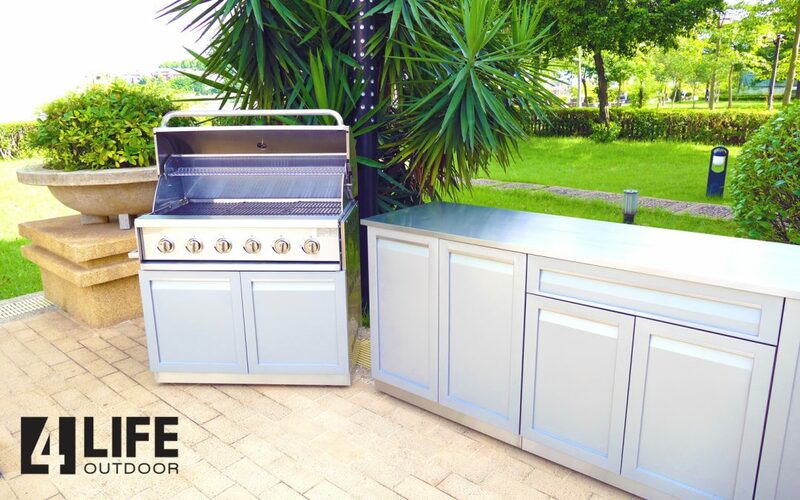 6 quality features of stainless steel cabinets - 4 Life Outdoor Inc. Stainless steel has a non-porous surface, so that no liquids, bacteria, fungus or mold can penetrate it. This means that bacteria, fungi, and dirt have nowhere to hide. With a quick wipe down, the dirt and yuck is easy to clean. Stainless steel is made of low carbon steel that consists of chromium and nickel. Chromium makes it resistant to rust and corrosion. Because rust isn’t an issue, moisture is not an issue. This means that stainless steel is perfect for outdoor spaces, sinks and high moisture areas. Stainless steel has significant chemical resistance. Most salts, organic chemicals, solvents and biological stains are not an issue. Some acids and bases are also not an issue. Because of the resistance, the salt from the sea or your pool, will have little effect to the cabinets. But, please do wipe down the cabinets routinely. The stainless is resistant but not chemical proof! It needs to be given some love to keep them for decades to come. Nickel in stainless steel makes it heat resistant. It can sustain continuous heat exposure above 1500 °F. There may be some discolor with prolonged high temperatures, but “it can take the heat”. Your BBQ heat does not come close to that temperature meaning your BBQ cabinet and Kamado corner cabinet are safe from any heat the grills put out. Stainless steels metal composition makes it highly impact resistant. While stainless steel can be dented, it is relatively easy to fix minor imperfections by buffing it out. And, while stainless steel isn’t scratch resistant, it does maintain its aesthetic beauty over a long period of time. Stainless steel is a recyclable material. The main alloying elements of stainless steel (chromium, nickel and molybdenum) are all highly valuable and can be easily be recovered and separated from other materials. Today, where environmental issues are so important in saving and preserving our world, stainless steel is cleaner for the environment. If you have any questions regarding outdoor kitchen cabinets or how the appliances work together, let us know! We are happy to hear from you.